I trust that Steven Selke has a handle on the letter “s” by now. Many years later, I again encountered St. Stanislaus. My husband Mark had the opportunity to purchase two reliquaries from a church that was closing. In them were the relics of 4 saints. Relics themselves cannot be sold, so he was paying for the old wooden reliquaries. A relic of St. Stanislaus was in one of them. Along with the relics came information on each of the saints. We learned that St. Stanislaus Szczepanowski (separate from St. Stanislaus Koska) died at the age of 48, martyred by the Polish King Boleslaus II the Bold on April 11,1079. There is some disagreement as to the date of his death, so in Poland his feast is celebrated on May 8. Stanislaus was born in Southern Poland, the only son of noble and pious parents. He became a priest and served the Church of Krakow. 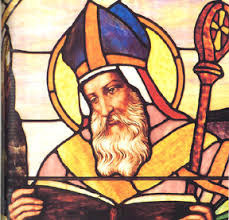 After the death of his diocese’s bishop, Stanislaus was chosen his successor in 1071 and became an influential preacher. However, his influence brought him into conflict with King Boleslaus II, who was notorious for his violent and depraved lifestyle. After a series of disputes with the king, Stanislaus failed to reform him and finally excommunicated the sovereign. The king accused Stanislaus of treason, and personally killed him with a sword while he was saying Mass. His many faithful followers were outraged, which led to the king’s dethronement. Stanislaus canonized by Pope Innocent IV in 1253 and is the patron saint of Poland. St. Stanislaus, pray for us! Help us to have courage like you had to be not afraid to speak the truth.